As a designer, I always get inspired by visiting great gardens. 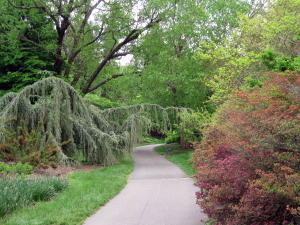 Olmsted gardens are some of my favorites. Frederick Law Olmsted, that is. He had a way of making a property or park remarkable no matter what time of year you saw it…Central Park is a great example. The reason for this is “Great Bones”. I’m not talking about the bones on the models from Paris Fashion Week (way too skinny)…garden bones are a whole other subject (let’s call it “beefing up”). 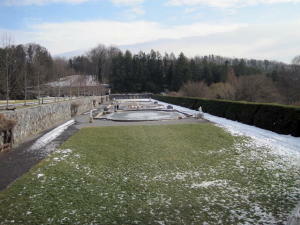 Last winter, we visited the Biltmore Estate in Asheville, NC – an Olmsted Garden. It had snowed 8 inches 3 days before we got there, which totally shut down the town of Asheville. 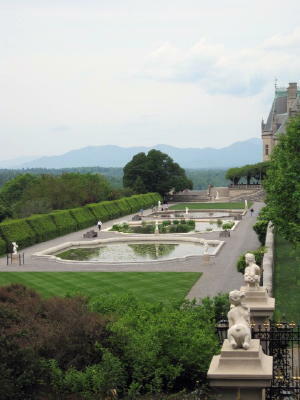 When we arrived at the Biltmore property, it was buzzing with tourists again, mostly at the mansion. 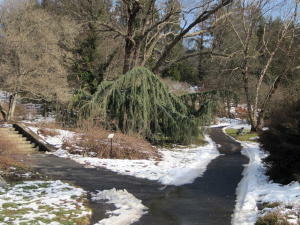 Not me, I was fascinated with the gardens and magnificent views blanketed with the snow. That’s what I mean. The garden was even interesting in the winter…because of the bones. 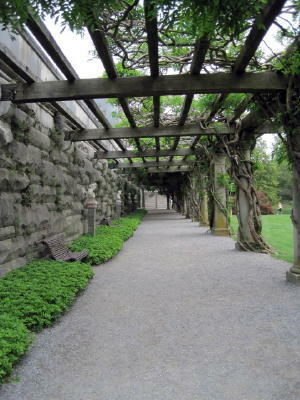 The stone walls that enclosed each garden, the carved sculptures and fountains, the intricate pergola structures, the massive tree groupings off in the vista…it was all there. Just like this massive property, a great garden design can be traced through elements that make up its “bones”. You’ve heard the phrase “she has great bone structure”? 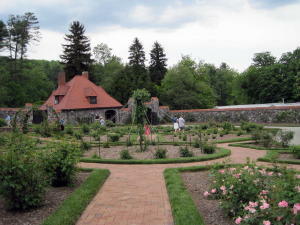 Well, it’s the same with gardens – it’s the bone structure that creates year round interest in a garden. Well, we just returned from our second trip to Asheville (we loved it so much the first time). I just couldn’t resist seeing the Biltmore Gardens in spring. Our timing was great, catching the final days of the annual Flower Festival on the estate grounds. The bloom season there is 1 to 2 months ahead of the Northeast, with Azalea, Rhododendron, Kousa Dogwood, Weigela and Roses all in bloom on May 1st. Even the potted annuals were thriving in the 75+ temperatures. 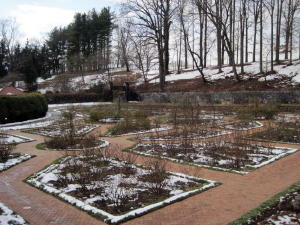 Compare the springtime photos (below) to the winter views (above) and you will see the “great bones” of this garden. 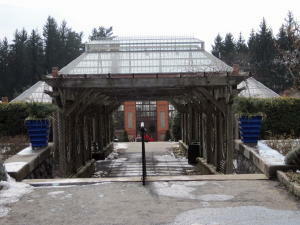 This entry was posted in Biltmore Estate, Garden Bones, Landscape Design, Structures and tagged Biltmore Estate, Garden Bones, Landscape Design. Bookmark the permalink. Wonderful post! We honeymooned there 13 years ago….in the Spring. Thanks for your detailed and informed perspective.